Lions and tigers and leopards, oh my! Prowling the urban jungle in animal overkill. How many animal references can you smoosh into an outfit? If you answer to the name of Bella, the answer is five. As in three big cats and two servings of galavanting giraffe. Toss in a foxy Tyrolean plaid for no good reason, and we've got something to see on a Tuesday, don't we? #SHOPSECONDHANDFIRST: 5 out of the 6 items were thrifted. The 6th item was acquired new, and is USA made. 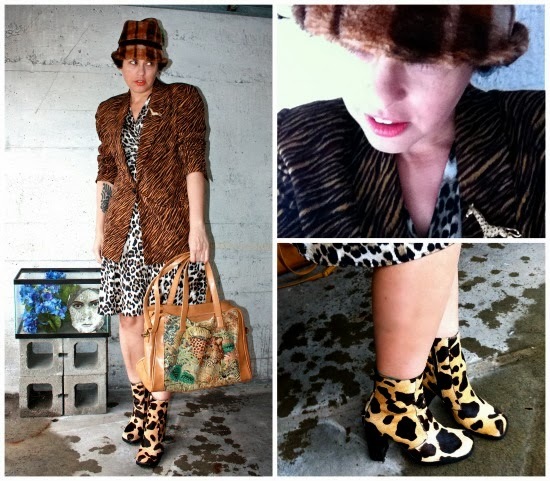 Is there such a thing as animal print overkill? Love it and especially love those booties! On anyone else it might be animal overkill (just saying!) but on you it looks absolutely fabulous dahling!!! You look fantastic! Keep on prowling the urban jungle. Oddly enough .. it all works together! 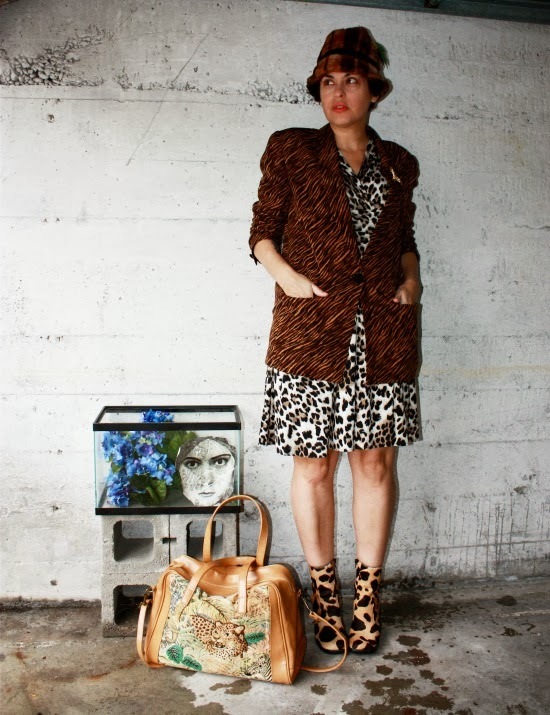 I love animal print clothes and bags and shoes. So I do own quite a bit of it. I have a similar jacket and dress, snake shoes etc. But those boots... hmmm I will have a look at your Etsy shop. They are nice. Trust you to combine all of it and get away with it as well. 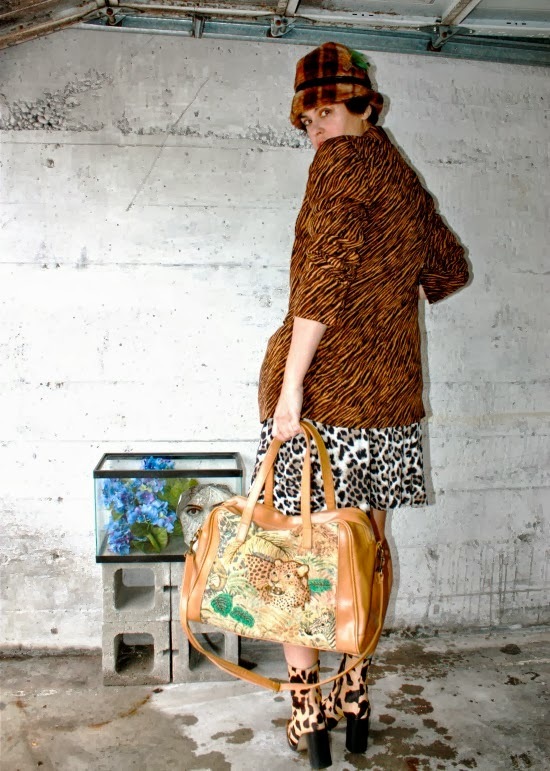 That cat duffle is tres chic. Who'd have thought you could squish so many animals onto one person? Rawr! All of Africa and a bit of Europe! Never too much animal print to an outfit. Thank you for linking up with Hat Attack in this spectacular chapeau. As i have said before dear Bella .... your styling becomes more fierce with each and every post! Kudos!! Darned, those boots are not on your Etsy site (or alreafy sold). Are they size 39 (North European size)? I had to come back to say how very inspired I am by your fabulous outfit here!! Bella, I saw this outfit on Adrienne's blog and it made me smile. You are an intrepid one! I love this outfit and all of its animal print vibes. Roar! Ah, thank you sweet Susan, and Tamera! Rawr! Took me 'til Thursday to see this, but it's given a wake-up jolt of inspiration to the rest of my week -- thanks! bella you look so beautiful! i adore that outfit! from head to toe its fabulous! a vision of style! OMG the leopard print Karina dress!! LOOOOVE. This whole outfit is amazing! I'm so glad you took the risk, because it turned out fab!